Joe McCarthy, (Joseph R. McCarthy) 1908-1957, Republican United States Senator from Wisconsin, 1946-57, dominated the anti-communist movement in the U.S., 1950-54, until his career was ruined by censure by the Senate. "McCarthyism" has become a general term for labeling groups or doctrines, the people who protect them, as threating America, and aggressively pursuing them, often in mass media, with scant regard for due process. Joseph McCarthy was born to a poor Irish Catholic farm family in Appleton, Wisconsin. A hyperactive, extroverted youth, he dropped out of school after eighth grade to start his own poultry business. After the chickens all died, he enrolled in the local public high school. Thanks to enormous energy and a retentive mind, he finished his coursework in less than a year at age 20. After two undergraduate years at Marquette University, a leading Jesuit school in Milwaukee, McCarthy entered Marquette Law School, acquiring the rudiments of the profession as he knit together a statewide network among Irish and German Catholics. McCarthy was a practicing Catholic his entire life, but rarely referred to religion or ethnicity in his speeches. He actively supported President Franklin D. Roosevelt in the Young Democrats, but did not join Irish organizations. Although defeated in his 1936 race for district attorney, McCarthy displayed remarkable campaign abilities and an astonishing memory for faces. He had the energy and determination to meet every voter in person, exuding charm and a concern for the voter as an individual. The same tactics paid off in 1939, when he was successful in a nonpartisan contest for a regional judgeship. In 1942 McCarthy, volunteered for the Marines (as a judge he was draft exempt), becoming an intelligence officer in an aviation unit heavily engaged in combat in the South Pacific. Although assigned a desk job McCarthy flew numerous combat missions as a tail gunner—he exaggerated the number to qualify for a Distinguished Flying Cross. McCarthy had his name entered in the Republican primary for U.S. Senate in 1944, opposing a well-entrenched incumbent, Alexander Wiley. The absentee war hero ran a strong second, making a name for himself statewide. Why McCarthy suddenly changed parties was never explained, but prospects for ambitious Wisconsin politicians were dim inside the poorly organized Democratic party, for most New Dealers supported the state’s Progressive party. During the war, however, that party collapsed, torn apart between its New Deal domestic liberalism, and its intensely isolationist opposition to Roosevelt’s foreign policy. Increasingly out of touch with Wisconsin, its leader Robert LaFollette Jr. looked to his family’s past glories and made the blunder of trying for reelection to the Senate in 1946 as a Republican. “Tail Gunner Joe,” endlessly crisscrossing the state while his opponent stayed in Washington, offered an alternative in the Republican primary to old guard Republicans who had opposed the Lafollettes for a half century. McCarthy brilliantly captured the frustrations citizens felt about massive strikes, unstable economy, price controls, severe shortages of housing and meat, and the growing threat of from the far left in the CIO. He nipped LaFollette in the primary. The slogan “Had Enough?—Vote Republican” gave the Republicans a landslide all across the North, electing a new junior senator from Wisconsin. In Washington, McCarthy was a mainstream conservative in domestic policy, and, like many veterans, was an internationalist in foreign affairs, supporting the Marshall Plan and NATO. His speeches rarely mentioned domestic Communism or flaming issues like the Alger Hiss espionage case, but that suddenly changed in early 1950 when his vivid anti-Communist rhetoric drew national attention. "The issue between the Republicans and Democrats is clearly drawn. It has been deliberately drawn by those who have been in charge of twenty years of treason.” Alleging there were many card-carrying Communists in Harry S. Truman’s State Department, McCarthy forced a Senate investigation led by Millard Tydings, Democrat of Maryland. McCarthy named numerous suspect diplomats but failed to convince the three Democrats on the panel; they concluded his allegations were “a fraud and a hoax,” while the two Republicans dissented. McCarthy retaliated by campaigning against Tydings, who was defeated for reelection in November, 1950. What the senator himself called McCarthyism was a factor in key races across the country; all his candidates won and his stock soared. A few weeks later American forces were crushed by the Chinese in Korea, and in spring 1951 Truman fired General Douglas MacArthur. The great majority of Catholics were anti-Communist, but they were also loyal Democrats, so to enlarge his base McCarthy, a Republican, needed an alliance with anti-Communist Catholics. The Catholic bishops and the Catholic press was "among McCarthy's most fervid supporters." A major connection was with the powerful Kennedy family, which had very high visibility among all Catholics in the Northeast. Well before he became famous McCarthy became closely associated with Joseph P. Kennedy, Sr.. He was a frequent guest at the Kennedy compound in Hyannisport, and at one point dated Joe's daughter Patricia. After McCarthy became nationally prominent Kennedy was a vocal supporter, and helped build McCarthy's popularity among Catholics. Kennedy contributed cash and encouraged his friends to give money. Some historians have argued that in the Senate race of 1952, Joe Kennedy and McCarthy made a deal that McCarthy would not make campaign speeches for the Republican ticket in Massachusetts, and in return, Congressman John F. Kennedy would not give anti-McCarthy speeches. In 1953 McCarthy hired Robert Kennedy as a senior staff member. When the Senate voted to censure McCarthy in 1954, Senator Kennedy was in the hospital and never indicated then or later how he would vote; he told associates he could not vote against McCarthy because of the family ties. With Dwight D. Eisenhower crusading against “Korea, Communism and Corruption” in 1952, Republican victory was assured. As a senior member of the majority party McCarthy for the first time became a committee chairman, with control of staffing and agenda. He used his Government Operations Committee to open highly publicized hearings in 1953-54 alleging disloyalty in the State Department, the CIA, the US Information Agency, and finally the Army. His furious attacks on the Army led to the televised “Army-McCarthy” hearings in spring, 1954, which exposed his bullying tactics to a national audience. As McCarthy’s poll rating plunged, his enemies finally pulled together to introduce a censure resolution focused on McCarthy’s contempt for the federal government, and especially for his fellow senators. McCarthy’s charges that over-educated liberals tolerated Communism at home and abroad had baffled the liberals. He alleged that they had corruptly sold out the national interest to protect their upper class privileges, and were so idealistic about world affairs that they radically underestimated the threat posed by Stalin, his spies, and the worldwide Communist movement. Instead of refuting the allegations, Liberals tried one of two approaches. Some became intensely anti-Communist and claimed they were more effective than McCarthy and the Republicans in eliminating Communism in the unions and Democratic party, and in containing the Stalinist menace in Europe. The other approach was to counterattack, to charge that “McCarthyism” never found a single spy but hurt innocent people in hunting for nonexistent witches; thus it represented an evil betrayal of American values. In an appeal to upscale conservatives and liberal intellectuals, critics ignored the Communist infiltration of labor unions and liberal causes and focused on stereotyping anticommunists as ill-mannered ignorant troglodytes, oblivious to American traditions of free speech and free association. McCarthy’s exaggerations and false charges encouraged opponents to stress the second approach, but it escalated the controversy to a pitch of hatreds and fears unprecedented since the days of reconstruction. McCarthy’s superb sense of timing and his media instincts kept his partisan attacks on the front page every day; his willingness to do battle in the hustings with Democratic opponents across the country strengthened his base in the Republican party. His religion and ethnicity, refreshed with highly visible friendships with leading Irish Catholics, especially the Kennedy family, bolstered his standing among Democrats. According to Gallup, McCarthy’s popularity crested in January 1954, when he was endorsed by all voters 50-29 (with 21 having no opinion). His core support came from Republicans and Catholics who had not attended college. McCarthy however failed to create any sort of grass roots organization. He had no organizational skills; he did not effectively use his talented staffers (such as Robert Kennedy). He was a loner who lurched from issue to issue, misled by the enormous media publicity into believing that a one-man crusade was possible in a an increasingly well-educated complex society honeycombed with local, regional and national organizations. By operating within the Republican party apparatus he lost the opportunity to create an independent grass roots political crusade in the style of Teddy Roosevelt, Huey Long, or Ross Perot. He never launched his own magazine or radio show or formed alliances with publishers who agreed with him. McCarthy’s strained relations with Senate colleagues created a trapdoor. It was sprung after many Republicans realized that he had shifted the attack away from the Democrats. What use was his slogan “20 Years of Treason” once Eisenhower was in office? McCarthy’s answer was “21 Years of Treason!” Eisenhower’s supporters could no longer tolerate such a loose cannon, and as McCarthy unwisely shifted his attacks to Eisenhower’s beloved Army, his cause was doomed. While many Americans distrusted Ivy League, striped pants diplomats, soldiers were held in high regard; McCarthy’s charges of subversion were flimsy (one Communist dentist had been automatically promoted); he sabotaged his own reputation by finagling favors for an aide who had been drafted. The televised hearings proved fatal to an ill-prepared bully. After the Democrats regained control of Congress in the 1954 the censure motion carried, 67-22. McCarthy’s appeal, so widespread yet superficial, evaporated overnight and the Senator faded into the shadows. McCarthy is permanently associated with "McCarthyism" -- he did not coin the term but he did use it, to mean an aggressive attack on Communists who had infiltrated America, and on the liberals who protected them, without regard for due process. Although the left was unable to make heroes of the people who supported and sometimes were controlled by Stalin, they did make heroes of opponents of McCarthy, paininting him as the internal menace to American values that was far worse than Communist subversion. Schrecker (1998) sees McCarthyism t as anti-Communist political repression of the early Cold War, and explores its mechanisms through, and what she considers the exaggerated public fears on which it depended. During the 1940s-1950s, McCarthyism took on a variety of forms with an array of agendas, interested parties, and modes of operating. Despite its widespread and popular character, it started with the federal government and was driven by a network of dedicated anti-Communist crusaders such as J. Edgar Hoover. McCarthyism's repression both responded to and helped create widespread fears of a significant threat to national security. Margaret Chase Smith, Republican senator from Maine, gained a national reputation as one of the earliest critics of McCarthyism in a Senate speech on June 1, 1950, called "the Declaration of Conscience." It was an attempt by Smith to address the excesses of McCarthyism, and was widely hailed as a call to reason by McCarthy's opponents. Smith gave a critique of the American political process and political institutions in the responses to dissent on the left and the right. Smith, like other McCarthy critics, sought to bring a level of civility to political protest and dissent. She and many others who objected to the tactics of McCarthy actually believed in the underlying tenets of his anti-Communist crusade. Their responses to his excesses reflected a desire to narrow the scope of acceptable political dissent. 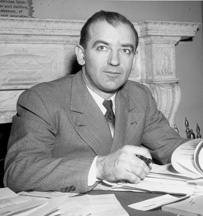 Rausch (2000) argues McCarthy's campaign had a lasting impact on the conduct of U.S. foreign relations, particularly among professional diplomatic institutions like the State Department and its Foreign Service personnel, and McCarthyism did not disappear with the senator's censure in 1954. The "ism" in a broad sense was a set of ideas not only about internal subversion but also about the outside world, including a simplistic, isolationist anti-communism and a deep suspicion about social reform movements abroad. It stood in open opposition to a more complex, even accommodating, view of communism. Instead of ending the hunt for subversives begun under Truman, Eisenhower made the search systematic, universal, and more broadly defined. McCarthyist Scott McLeod took over security and personnel functions of the State Department and became one of the most famous and despised men in the executive branch. McLeod brought McCarthyist methods and assumptions to bear in ridding the department of what he defined as security risks. Oral history sources provide key evidence for the destructive atmosphere within the department in these years, and they shed valuable light on McLeod's impact on the foreign affairs bureaucracy. In the short term, the Foreign Service declined in morale, prestige, and influence. By 1954, professionally trained diplomacy, with nuanced, internationalist views lost ground to more simplistic, strictly anticommunist views. During Eisenhower's second term, the Foreign Service and the more moderate approach experienced a resurgence but still faced opposition from hard- liners who survived the McCarthy years. The Latin American branch of the department embodied the changes in professional diplomacy towards one region of the world. Within the division were the institutionalized tensions of the Eisenhower administration, between career diplomats and political appointees, conservative and moderate anti-communists, and trained diplomats and other specialists. The U.S. embassy in Cuba showed this internal conflict in a microcosm, as the administration's response to Latin American revolution evolved after 1954. McCarthyism accompanied Eisenhower into office, and its effects continued into his last foreign policy crisis and beyond. In California McCarthism began before the Senator was famous. In 1946 in the Los Angeles schools two teachers from Canoga Park High School were called before the Tenney Senate Investigating Committee on charges of communistic teaching. The two teachers were exonerated of all charges, but a campaign to rid the LA district of dissident teachers was effectively launched. The target of the campaign was a group of teachers who belonged to the Los Angeles Federation of Teachers (LAFT), formerly known as Union Local 430 and chartered under the American Federation of Teachers, until 1948, when the AFT revoked the charter. By 1954, Los Angeles teachers were required to take five loyalty oaths, although not one teacher was ever charged with or convicted of subversion. In 1953, the Los Angeles City School Board announced that 304 teachers were to be investigated because of alleged Communist affiliations. The Dilworth Oath, made law in 1953, required teachers to answer questions posed to them by the Investigating Committees. Teachers who refused to answer the Committee questions by claiming their Fifth Amendment rights could then be fired by the Board for insubordination. Historians have debated the degree to which McCarthyism permeated the American mood and popular culture. Anti-Communist liberals at the time said it played to isolationism (especially strong in McCarthy's Wisconsin) by diverting attention away from the real threat, Stalin's Soviet Union as an external power. The Left said that they had a First Amendment right to their beliefs and that McCarthyism had a chilling effect. Dussere (2003) shows that comic strip artist Walt Kelly in "Pogo" parodied McCarthyism and promoted leftist politics as old-fashioned American common sense, representing a time when concerns about art and politics with respect to popular culture were in the forefront. Hoover's FBI targeted retired film comedian Charlie Chaplin because of his status as a cultural icon and as part of its broader investigation of Hollywood. Some of Chaplin's films were considered "Communist propaganda," but because Chaplin was not a member of the Communist Party, he was not among those investigated by the House Un-American Activities Committee in 1947. Nevertheless, he was vulnerable to protests by the American Legion and other patriotic groups because of both his sexual and political unorthodoxy. Although countersubversives succeeded in driving Chaplin out of the U.S., they failed to build a consensus that Chaplin was a threat to the nation. Chaplin's story testifies to both the power of the countersubversive campaign at mid-century and to some of its limitations. Strout (1999) looks at The Christian Science Monitor; during the McCarthy era (1950-1954) it was a highly influential newspaper at home and abroad. Strout asks: (1) Was the Monitor a consistent critic of McCarthy? (2) How did the coverage compare to other elite and popular press newspapers? (3) How did the pressures associated with McCarthyism effect individuals at the Monitor and its news product? An extensive review of editorials and news articles suggests that it was thorough and fair in reporting, yet outspoken and responsible in editorial criticism. Mary Baker Eddy's original 1907 statement that, "The purpose of the Monitor is to injure no man, but to bless all mankind," was referred to repeatedly in interoffice correspondence during the McCarthy era. The Monitor did not attack McCarthy personally as other papers did, rather, its criticism centered on the actions of the senator and the negative effects they were having at home and abroad. The Monitor served as a voice of moderation, yet at the same time, remained a persistent critic of McCarthy's tactics. Individuals were affected by the pressures of McCarthyism. For instance, veteran Washington correspondent Richard L. Strout was suspended from covering McCarthy for eight to twelve months after being mentioned in McCarthy's book, McCarthyism: The Fight for America. ↑ Charles R. Morris, American Catholic (1997) p. 248-50, quote on p. 248; James Waldron Arnold, Objectivity in Selected Catholic Diocesan Newspapers (1954) p. 49. ↑ Kevin Kenny, The American Irish (2000), 242-43.